The only UK owned American style sports bar has opened its newest venue at the Waterside, Merry Hill in the Midlands with a VIP evening. The new opening is creating over 30 new jobs. Bar Sport’s Head Office is based in Cannock and the Company was established by local entrepreneur, Scott Murray. The Company has plans to open over 8 new franchised outlets by the end of this year - with longer term plans to open in every town and city in the UK. Next on the list is Ipswich in September. Bar Sport Merry Hill is owned and run by Harry Dass from Dudley who is the former presenter of an Asian Radio station. He is a keen sportsman himself who loves cricket, rugby and football. Each bar is decorated throughout with authentic sports memorabilia and the venues feature over 50 screens showing live sport all through the day and evening. “We are delighted to be opening another Bar Sport right here in the Midlands. Waterside in Brierley Hill is a perfect location for us as the area has such a strong sporting fan base. We are pleased to be doing our bit for the regeneration of this particular area and we wish Harry and his staff well. We all know that pubs and other venues are having a tough time. To be successful, you have to be offering the public more than just food and drink. The reaction to Bar Sport elsewhere shows that we have a winning formula, with large crowds turning out. We offer fun, sporting excitement and good food and drink in a safe family orientated environment. We plan to open 8 new outlets across the Country by the end of the year with the next opening being in Ipswich in September, then London. Openings are also planned in Glasgow and Exeter. These will be franchised outlets run by their owners and in tune with local taste. They will have been fully trained and supported by our Head Office staff. Each bar will have regular visits from sporting heroes such as football stars, boxing champions and many more. To find out more, go to www.barsportmerryhill.co.uk or call 01384 485060. 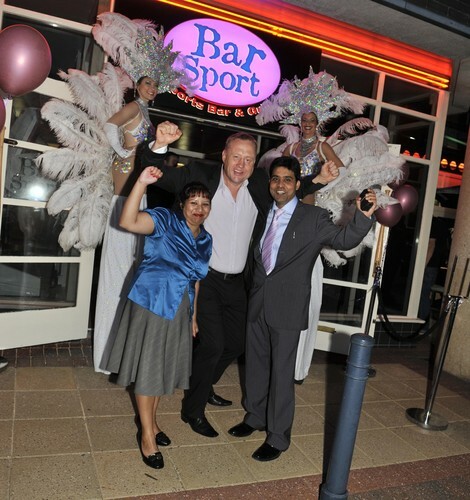 For more information on owning a Bar Sport franchise, go to www.barsportfranchise.co.uk or call 01543 500247. Issued by: Ray Woods from interactive wardlovett on behalf of Bar Sport. Tel 01543 501111 or mobile: 00 44 7967 686230. Contacts: Scott Murray founder of Bar Sport Tel: 07891 400068.
or Paul Greaves Franchise Manager for Bar Sport Mob: 07773 394546. This press release was distributed by ResponseSource Press Release Wire on behalf of Interactive Wardlovett in the following categories: Leisure & Hobbies, Food & Drink, Business & Finance, Retail & Fashion, Construction & Property, for more information visit https://pressreleasewire.responsesource.com/about.